Jag Thug finally announced their champion this year 2015 and it's great to hear that another kababayan has bagged the award and prize. The winner this year is XB GenSan hip hop dance crew. After winning third place at World Supremacy Battlegrounds last year, it was indeed great to see the group improve and won such a remarkable 'Dance' competition. 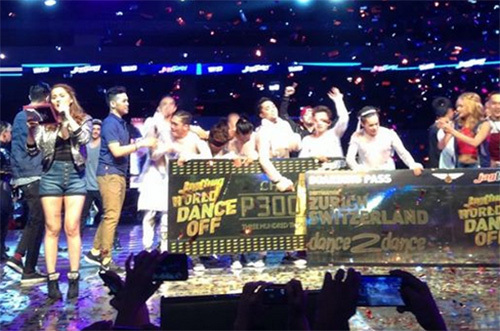 XB GenSan has won Php 300,000.00 as the cash prize and they will be representing the Philippines at Dance2dance 2015 in Switzerland this coming November 14, 2015, this was confirmed by It's Showtime host Jhong Hilario. Hilario said, "Bukod sa perang natanggap nila, papadala sila sa Switzerland para i-represent ang Pilipinas, kaya congratulations." JAGTHUG shares the winning moments of the XB GenSan through their Facebook account and captioned: "Congratulations to this year's ‪#‎JagThugWorldDanceOff‬ Champions, XB Gensan! ‪#‎JTWDO‬ ‪#‎DareToCompete‬"
Comments or suggestions about "Jag Thug World Dance Off competition won by XB GenSan" is important to us, you may share it by using the comment box below.